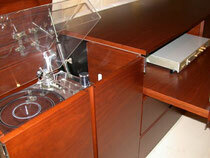 The finest phono system: turntable with Swiss MC cartridge & FM 222 MKII - FM ACOUSTICS LTD.
"A living room filled with life and with lifelike music and picture... is what I dreamed of" explains the owner of this ravishing modern single floor home that features a 180 degree view of the lake. The entire project consumed twenty-six months of the most careful planning. While keeping an unpretentious look every little detail had to be of the absolute ultimate quality to satisfy the owner's eclectic taste. For the living room an Inspiration System II was chosen. 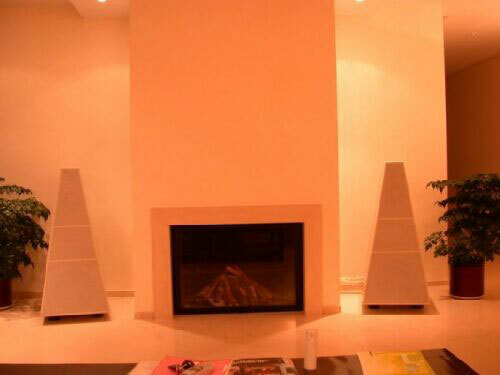 It was planned to run this as a pure stereo system which at the same time could be used as front speakers of a 5-channel AV system, but after numerous trials the client decided not to install the surround and center speakers. "With music and sensible movies the surround system only detracts from the purity of sound emanating from the XS-II. The Inspiration System is so holographic-like that you do not want to spoil this unique experience. We do not watch brutal and action movies so we do not mind at all that when they 'shoot from your back' we will not get that effect due to the missing surround speakers. Instead I get detail, intelligibility and an incredible "be there" effect, which are much more important in sensible movies than the gimmicks from the rear" explains the owner. "In fact, after we had experienced the Inspiration System we also abandoned the idea to install a multi-room system (speakers in every room). The system has such an extraordinary transparency that even in the other rooms it sounds much more realistic and agreeable than the various multi room speakers that were tried". The XS-II's are driven by two FM 611X high power amplifiers delivering peak power of 2800W each ("you don't use the power but the you need reserves for dynamics. The dynamics are awesome, the speaker is totally controlled by the unique damping characteristics of these fantastic power amps"). The two stereo amplifiers are installed inside a cupboard in an adjacent room together with the low- and high level crossovers. From there they drive the bi-amplified XS-II's directly. No equipment or wires are in sight, all were installed in walls and below the marble floor. The sources and control units are hidden in a custom fabricated furniture behind the sofa. "You'd hardly know what this contains..." explains the owner pushing a button on which the entire center section of the furniture raises and the beamer is elevated to the optimal height. Opening up the left side a high quality turntable appears, next to it an FM 222 MKII Phono Linearizer which preamplifies the minute signal from the moving coil cartridge to the FM 268 Line stage/Harmonic Linearizer. "While the FM 222 has been acknowledged worldwide as the absolute standard of excellence, FM ACOUSTICS'S new Harmonic Linearizer is a 'once in a lifetime' product. We had planned for the FM 266 line stage but when we were shown this singular unit and realised what amazing improvements the FM 268 can bring to existing CD's, LP's and movie sound there was no question. It needs a couple of days until one gets the experience to adjust the controls but the fantastic linearizer section improves the reproduction in a way never before possible. Previously unlistenable CD's can be made to sound pleasant and LP's that are lacking in certain qualities can be improved dramatically. With movies the improvement is in balance, detail, space and often in the intelligibility of the dialog. Sources are the turntable, CD/DVD player and TV signal. While the location is magnificent, the acoustical properties were not easy with very little sound absorbing furniture and carpets. As in the St. Margerita system the Inspiration System proved to be unparalleled in being able to get the acoustically difficult room to sound phenomenal. In the owners "relax / waterworld" area - which consists of a steam bath, a jacuzzi, a multi direction shower, a sauna and a resting area - natural sound reproduction was asked for. 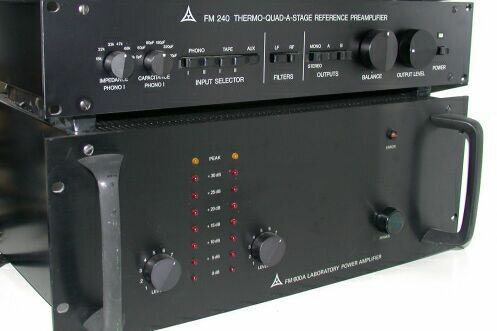 After various trials with different systems the owner finally remarked that his trusty old FM ACOUSTICS system consisting of the 25 year old FM 240 preamplifier and FM 600A power amplifier proved to be more musical than the new units of different "high-end" brands that had been tried for this purpose. "Instead of trading The FM ACOUSTICS units in - I was astonished at the trade-in value they still possess - we installed them here. The detail of sound and the transparency in this almost cavernous bath area surprised everybody".